And so it is that we meet Lady Sophronia, the poor daughter of an impoverished earl on her way to tend to a cousin's children and chickens for the rest of what is certain to be a dreary life, in Megan Frampton's excellent No Groom at the Inn. Sophronia is lamenting her lot and drinking a beer during a break in her travels when a tall and handsome stranger, Jamie, appears and asks her to marry him. Not for real, of course, but to pretend to be his fiancee to get him out of his mother's matchmaking at a country house party for the holiday. In return for her services, Jamie will give her all the money she'll need to buy a cottage somewhere and life the rest of her life in peace and quiet. 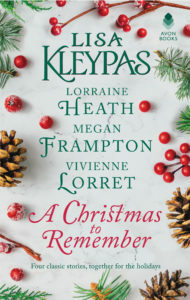 No Groom at the Inn is available as a stand-alone novella, AND this year it's been put into a lovely collection called A Christmas to Remember, which features other holiday novellas from Lisa Kleypas, Lorraine Heath, and Vivienne Lorret - so you really can't go wrong. Get this novella, read it, and fall in love. Seriously. Sophronia begins the book with a beer, and ends it in a marvelous golden gown. Obviously we need something that combines the two, right? This, my friends, is a Golden Ale Beer Cocktail. (Photo and recipe from The Beeroness.) Now, I didn't realize beer cocktails were becoming a thing but apparently they are and hence, this! As someone who counts Kona Brewing's Big Wave Golden Ale among my favorite beers, I am intrigued by this idea. BookBash wraps up tomorrow! Can you believe it? :) See you back here!